Woodstock's 50th anniversary extravaganza Aug. 16-18 in Watkins Glen, N.Y., unites some of today's hottest acts and yesterday's memories. It also gives Michael Franti a chance to continue his crusade for those in need. 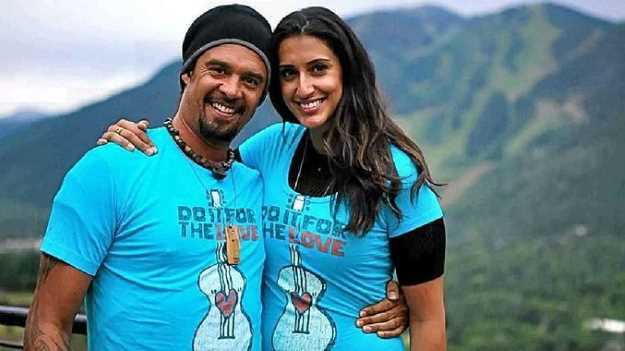 Take "Do It For the Love," the nonprofit Franti started six years ago with his wife, Sara. The wish-granting organization brings people living with life-threatening illnesses, children with severe challenges and wounded veterans to live concerts. 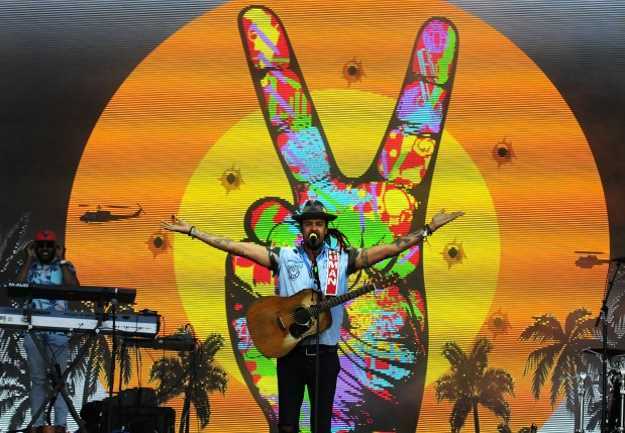 Franti can seize Woodstock - he joins a first-day cast that includes The Killers, Santana, Robert Plant and Miley Cyrus - to network other performers to jump on the ever-growing "Do It For the Love" train. "The great thing when I do an event like that is that I'm able to talk to artists backstage and on stage I'm able to tell fans in a massive concert" about "Do It For the Love," Franti said. "It's mainly getting the word out among the artists." Franti and some musical friends perform May 23 at Vines & Vibes, the fifth annual dinner and concert benefiting "Do It For the Love" at Meadowood Napa Valley. The $1,000 per person ticket may be pricey, but anyone can contribute to "Do It For the Love" on the nonprofit's website. "I always say when I'm talking to people, you can share a Facebook post (about a 'Do It for the Love' event), or donate $5 or donate $5,000," Sarah Franti said. "All of it matters. Spreading the word is one of the most important things." "Do It For the Love" has granted more than 2,000 wishes to see artists ranging from Blake Shelton to Lady Gaga and shows from Hamilton to Sesame Street Live. With the Bay Area couple, it's always about helping others. Last year, Franti released "Flower In the Gun," an anti-gun violence song and video that included Pati Poblete, founder of the Solano-based Robby Poblete Foundation. "To see how much tenacity Pati has ... I feel like people in this country are finally turning the corner" on gun violence," Michael said. It's all in the realm of the couple's motto: "Do your best, serve the greater good .. and rock out wherever you are." "It doesn't mean be the best," Franti said. "Do your best. What can I do in this situation to improve my life and how can I help others? Rock out wherever you are keeps us going. If I'm not having fun connecting with people and celebrating life, I get burned out." Often on the road, "I get to see how music effects people when they walk into a venue," Franti continued. "They're carrying everything in life to the show. When the music starts, it all drops. People hug strangers. They meet someone, get married and have kids. It keeps me going." In April, 2013, Steve and Hope Dezember reached out to Michael and asked that Steve's wish to attend Michael Franti & Spearhead's concert be granted. Steve is living with advanced stages of ALS (Lou Gehrig's disease). During the show, Michael invited the couple to join him and the band onstage. Though Steve was barely able to move his body, he asked Hope to lift him out of his wheelchair. Wrapped in each other's arms, they danced on stage in front of 20,000 fellow music fans. "I'm crying and cheering," Franti said, remembering that he approached his wife afterward and said, "Sara, let's do this for as many families as we can." And "Do It For the Love" was born. "The thing that blows us away is what 'Do It for the Love' has become and the community that has been created around it," Sara said, joining her husband on a conference call. With 2,000 "concert experiences" granted - at four guests per concert - "that's 8,000 people moved and touched and experiencing joy through music," Sara said. Plus, interjected Michael, "all the artists who get reconnected and grounded in why they do music," and its inspired volunteers, donors and fundraisers "to do other good things in the world." Adults and children suffering life-threatening illness or wounded veterans (PTSD included) have benefited from the project. People can nominate themselves or others. There is a process to assure authenticity, including a doctor's note, Michael said. "We also ask that they stay close to home" for the concert because of budgetary restraints, Franti noted. "That's worked out really well. We've had kids nominating parents, which is really cool to see." With a nursing background, Sara said she and Michael definitely get emotionally involved with each recipient. "To be human is to feel connected," she said. "We hear their stories and we cry." The experience of helping others with major health obstacles have helped Michael and Sara handle their own situations. "It gave us the power and capacity to get through it together as a family," Sara said, thrilled the nonprofit "grows exponentially every year. The more people hear about us, the more they want to support it." The list of artists supporting the cause is also growing, Sara said, including Carlos Santana, Ed Sheeran, Stevie Nicks, and Pat Monahan from Train. "We have so much fun with it," Michael said. "It's been really great, as an artist, to connect all these musical genres." "Do It For the Love" has reinforced Michael and Sara's commitment not just to humanity, but each other - and, with 8-month-old son Taj - living in the moment. "That's why we believe in music so much," Michael said. "It helps people to enjoy every second." There were the days when Michael wondered how he would pay for food and rent. "Now I'm a little more settled," he said. "I really appreciate every little cry Taj makes, every moment we have when I'm singing him to sleep each night." And the most romantic thing the two have done for each other? "I gave Michael a child," Sara said. Tough act to follow. Michael gives it a shot. "And I accepted it," he said. BottleRock presents Vines & Vibes Fifth Annual Benefit Dinner and Concert featuring Michael Franti & Friends benefiting Do It For the Love, May 23 at Meadowood Napa Valley, 6 to 11 p.m. Limited seating, $1,000 per person. For tickets or other ways to help Do It For the Love, visit doitforthelove.org.